Previous PostPostal Stamps: A long forgotten treasureNext PostSGD INR: 50 with SG@50? Thanks for your comment, Aditya. But taking into account falling oil prices, I think this is a big big positive for India and kind of neutral for Singapore. If you see the exchange rate movements in the last couple of weeks taking into account falling Euro, falling JPY, falling oil prices, rising USD.. the net effect has been resilient INR and shaky SGD, which is why I think, INR may not fall against SGD. Even today, if you look at INR it is 61.76 which is pretty bad rite, but look at SGD it is 1.298! its just moments before it will pierce 1.3! Hi Aditya, I have been following your blog since 2009 and in those days you used to whole heartedly be in favor of converted SGD to INR. I wonder why you are so skeptical now, when the Rupee fundamentals are much better. Look at how much the SGD has fallen recently against the USD. 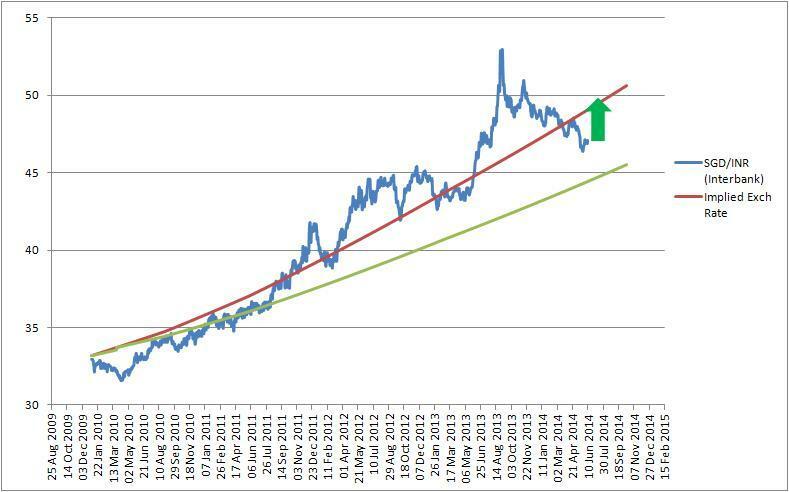 My guess is next 5 year INR will outperform the SGD, even if it doesnt outperform it wont underperform like the last 5 years. I did some back of the envelope calculations. Even if you had tfr’ed SGD to INR 5 years back you are still in profit now considering the fixed deposit interest rates in India. My suggestion to everybody. Convert your SGD holdings to INR now! and lock in to NRE FD for 2-5 years while the interest rates are still high in India. Hi Nitin, great to know that you have been following me. Thanks to support like yours I get inspired to write though must admit have not been that regular in the past few months. Converting to INR has always been a good strategy. The only reason I think there is scope for SGD INR going back to 50 is the strength of USD, which has shot up against all currencies. The Indian fundamentals have not really changed but there are hopes they would change with the new prime minister. Key would be RBI’s rate meeting in December. Thanks for your response and time. Agree with you that we would not see any sudden change. However due lot of positivity shown in Indian market would eventually start appreciating INR. Personally my take away would be to closely moniter the market and of course your very informative and supportive feedbacks in this blog. What you feel about forex SGD INR in current situation where Indian govt. (BJP) getting more stronger post recent elections in Mharastra and Haryana ? Thanks for writing these blogs. Having a stable government is good but the fundamental changes are still atleast 6 months away. Falling crude oil is a good sign but US would stop the QE pretty soon, maybe tonight. I dont see Rupee appreciating suddenly and govt and RBI would also like to keep it in predictable zone. I expect it to hover above 60 mark against the USD. Haven’t heard your views in quite a while 🙂 Any interesting inputs in the current circumstances?